However, if you’ve procrastinated so far, want to increase your site’s compatibility with the Block Editor, or are looking for a block-enabled theme for a new site, we’ve got you covered! In this post we’ll present ten block-enabled themes you can try out right now. While all of the themes in this list are compatible with the Block Editor, some look to enhance its functionality. What’s more, several of these themes were designed and released within the past year, specifically for the purpose of creating a superb publishing experience with the Block Editor. As always, each of the themes in this list have high user ratings and reviews, and are updated regularly. Without further ado, here are the ten block-enabled WordPress themes, in no particular order. Myth calls itself a ‘storytelling’ theme, and we can see why. Not only is it compatible with Aesop Story Engine, but it also has beautiful grid layouts for your home page, and Category and Authors archives, so you can display your content to draw visitors in and tell your site’s story. This theme also offers advanced image features to give you more control. You can use full height images, overlay titles, set the opacity and more to create stunning featured images for posts and pages. You can also add global settings for consistent design across all of your featured images. Includes a separate grid control for your home page and archives. Enables additional featured image controls. Provides compatibility with Aesop Story Engine. This content-focused theme was designed with magazines and writers in mind. If you want a block-enabled theme that will let your content have the spotlight, Narratium may be the way to go. With this theme, you’ll be able to add elements to collaborative posts, such as co-authors, word counts, and reading times. Narratium also features templates for posts and pages, and AJAX navigation with the ability to add transition effects. Provides an extended template system. Enables you to add co-authors, word counts, and read times to posts. While there are plenty of themes that have been adapted to the Block Editor, others have been newly developed to be specifically compatible. Gutenote is one example. It was created for “newbie bloggers,” and could provide a nice introduction to the new way of creating content in WordPress. Gutenote comes with a variety of post types, including quotes, videos, galleries, audio and more. It offers flexibility when it comes to the type of content you want to publish. You can display your most popular posts on your home page for maximum visibility. Provides a simple blogging experience that’s ideal for new WordPress users. Designed with blogging in mind and offers unique post types like quotes, videos, and more. Includes creative home page layouts. 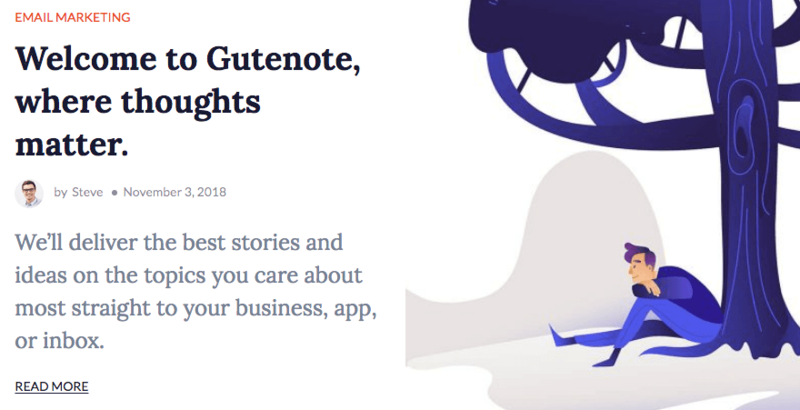 Another theme created specifically for WordPress 5.0, GutenMag is designed to create multimedia posts for blogs, newspapers, and magazines. If you want to stretch the Block Editor to its fullest potential, this theme may be a good place to start. GutenMag enables you to create more than a dozen unique post types, and includes custom blocks to use in creating your posts and pages. What’s more, it supports all native blocks too. Includes unique Block Editor elements and modules. Created with multimedia layouts in mind. Provides 15 unique post layout options. As its name might suggest, Contentberg is all about displaying attractive, readable content. Optimized for the Block Editor and compatible with popular plugins like WooCommerce, Yoast SEO, and WPBakery Page Builder, this theme promises high functionality beneath an unassuming minimal design. This theme is ideal for blogs and magazines with multiple post styles, category layouts, headers, and footers. Additionally, Contentberg offers several home page layouts and other page templates. Provides compatibility with the WooCommerce, Yoast SEO, and WPBakery Page Builder plugins. Includes home page layouts, custom widgets, and multiple post formats. Created with blog and magazine sites in mind. Ideal for meetup and event sites, Mae is a relatively new theme designed for the Block Editor. This theme is easy to use for those new to WordPress, and includes some premium blocks for an enhanced Block Editor experience. Mae has been optimized for speed and for search engines, so you can count on it to give you a leg up when it comes to promoting your events. It also has a masonry grid format that enables you to make optimal use of your ‘canvas’. Provides access to premium blocks for content creation. Optimized for speed and search engines. Includes masonry grids to make optimal use of page space. Designed for blogging and publishing with the Block Editor, GutenType is a new theme that supports practically all blocks. There are some pre-built pages to help create new content rapidly. Plus, this theme includes custom shortcodes tested for Block Editor compatibility to make your site more customizable. GutenType is designed to work for nearly all kinds of blogs and businesses. It even includes WooCommerce compatibility, so you can use it to open an online store and monetize your site. Includes shortcodes tested with the Block Editor. Provides pre-built pages for fast site creation. Tabor was built for content marketing and using the Block Editor. This theme is designed to improve your online presence through content delivery and social sharing, with an emphasis on professionalism. Much like other themes on this list, there’s compatibility with some of the most crucial content marketing plugins, like Yoast SEO and MonsterInsights. It’s also been built with Search Engine Optimization (SEO) in mind, so you have a head start when it comes to ranking highly in search engines. Features a sleek, professional design. Supports crucial content marketing plugins including Yoast SEO, OptinMonster, MonsterInsights, and Schema. OceanWP is a free multipurpose theme that isn’t strictly block-enabled like others on this list. By default, it does support the Block Editor, but is also compatible with myriad page builders. This theme also provides quick page load times and a great foundation for solid SEO, due to its clean and optimized code. If you want to add more functionality, you can also purchase any of OceanWP’s premium extensions. This makes it a supremely flexible theme for practically any website. Offers extensions for aspects such as e-commerce, portfolios, social sharing, and more. Provides fast page load times. 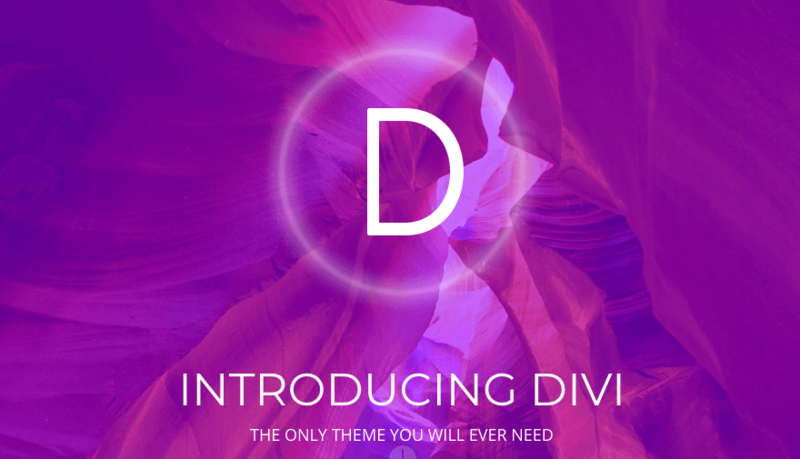 Elegant Themes members obviously have access to our flagship theme, Divi. We’ve worked hard to make Divi compatible with the Block Editor and get it ready for WordPress 5.0. Let’s take a closer look. The Visual Builder has always been useful for front-end page building. However, you can switch between the familiar back end editing experience and the Visual Builder without having to leave your editing screen. We’ve always been proud of how customizable Divi is, and it now has even more options to do so. New features such as dynamic content and hover options are available, and we’ve made several improvements in functionality too, with more search and file upload options. Works with both the Block and Classic Editors. Includes a new back end Visual Builder experience. Provides new features for more website customization and more efficient building. With a new era of WordPress upon us, it’s not a bad idea to make a fresh start with a block-enabled theme. Whether you prefer revamped old favorites, or want to try out a fresh new theme designed with the Block Editor in mind, there are plenty of options at your disposal. What’s more, we’ve also brought Divi into the age of the Block Editor, with a new Divi builder capable of functioning with WordPress 5.0. However, Divi itself still offers immense customization options and flexibility, and we’ve brought the Visual Builder to the back end for more efficient building. Of course, if you can’t part with our classic Divi Builder, you can always enable the Classic Editor to continue using it. Do you have any questions about block-enabled themes? Let us know in the comments section below! The post 10 Block-Enabled WordPress Themes You Can Try Out Now appeared first on Elegant Themes Blog.